This is still one of my favorite pieces, despite lacking the multi-monitor resolutions needed. I would love to see it available in additional resolutions. Perhaps even an updated version, that being said I'm not sure how you would improve it. "Dispersion from the 2007 gallery"
The crystal clear vases and radiating spectrum of light are symbols of hope, kindness, and care for each other and all species on the planet. That being said, we are the vases, and the radiating spectrum of color is the light within each of us. The Colours are almost blindingly vivid! Feels like my eyebrows are about to catch fire! I love the colors of the bottles and the way the light blends. It reminds me of when I played with glow-sticks as a kid, pouring the liquid into bottles and analyzing the ethereal glow. The only trouble I have, though is that the multi screen resolutions are not wide enough for 16:9 aspect screens. The tri-screen adequately fills a double 16:9 without much spilling over, but with three 16:9's, I've got large black bars at the sides, or the top and bottom are severely cropped to fit. I would try extending it myself, but I don't think I would do anywhere near as good of a job as it deserves. Thank you for the awesome work, keep it up! This is my current wallpaper. It looks awesome on my 24" HD monitor. The colors are amazing...liquid light! "I'd like to be at this party"
Great digital emo art - I want to take part! "Dgital Blasphemy is the best"
To whom it may concern, I love this website and your work. I have been an admirer of your work since 2002, but never had the cash to put down for a membership. I found out about this website from a friend who was a regular fan of yours also. Keep up the good work, now that I am a member, it makes me want to build a better computer with better graphics to better see your work. Thanks. Ryan: Echoing Frank S, thanks very much for the newer resolutions (5K is what matters to me!). This is one of my favourites, and I'm delighted to finally have it at the native resolution of my iMac's screen. Ryan, thank you very much for the updated resolutions! This is one of my favorites! This really is MY all time favorite. It has been my iPhone wallpaper for years. (It has changed briefly to other DB pictures a couple of times, but always goes back to this pretty quickly.) I just got my Decal Girl phone case with this piece on the back and sides. I'm with jlpilkin on this one - this (and Reverie, my favorite) look fantastic even years later, and I'd love to see them rendered in higher triple-screen resolutions. I use your triple-screen wallpapers on my retina MacBook across multiple desktops, and although the effect isn't quite as impressive as multiple physical displays, I still love them. Is there any chance in the future of triple-screen split files for 2880x1800 displays? It'd be a lot easier than splitting higher triple-screen files manually, though I understand that there might not be much demand. Interesting. They say imitation is the sincerest form of flattery and he does give me credit for the original. Thanks for bringing it to my attention! Hey Ryan, I was on deviantArt today, and saw this on someone's page. He/she gives you credit, calling it a "Cover." What do you think? This is one of my all time favorites. Love the bright colors against the black contrast. Every time I see it, it just makes me happy. Thank you. My favorite has always been Dispersion. It has amazing color, it's dynamic, and every time I've had it on my desktop, it's brought very favorable comments. Most folks think it's a photo. Whenever I get bored with my current wallpaper, I bring back Dispersion. Lovelovelove it! This is one of my favorite wallpapers that I have for my late-night rotation (along with several of your other abstracts). One issue is that I have a triple 16:9 widescreen setup, and the 4800x1200 isn't quite wide enough. As a matter of fact, the wallpaper software I am using mistakes it for a dual-screen background sometimes (due to me having three wide-screen monitors side-by-side). Is there any way you could put a triple 16:9 render on your todo list? Also, there are several other triple screen wallpapers in your collection that are also limited to 4800x1200. If you ever have the time and resources, I would appreciate a triple 16:9 render of those as well. This has been one of my favorites since I first saw it. Easily in the top 3, maybe even #1 itself. Even better is that you made an animated version of it. I like pictures with lots of color and/or rainbows, but this is one of the coolest implementations of that idea I've seen anywhere. Well done! I did do a few special renders for the old iPhone resolution. I will try to update those for the new resolution. Thanks for reminding me! Any chance you could do the 640x960 iphone4 render similarly cropped/perspective-adjusted like the 320x480 version? If you compare the two, the 320x480 includes much more of the original in it. Thanks! This is one of my favorites! Love the blend in the colors! I use it on my DROID a lot! Wow, this is one of the reasons I joined DB, but i think it could do with a rework - some smoothing of the glass. otherwise i really love it! This has become one of my favorite, soothing pieces that you've ever done Ryan. I love it. One of the wallpapers I love the most. Geat job. I just feel like poring all of them in a bowl and diving in naked. A true color explosion! It looks like you would glow in the dark if you drank it. Awesome colors and reflection. I've been using DB wallpapers for years and I just can't switch from this one. All time favorite. I get more comments at work on this one than any other I've had up. Thanks for all the great work! I really love this one. I love the way the colors pop. If you look at my screen with all the lights off, the image is so cool. I wouldn't change a thing. I LOVE this image. The colors really POP out at you. I have it on my iphone and laptop. GREAT job! 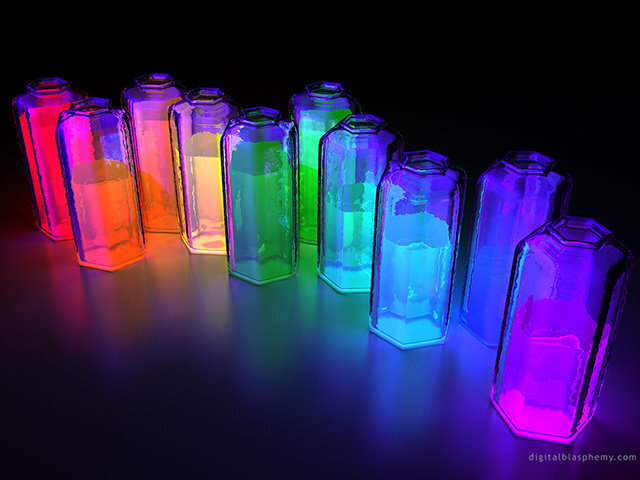 Tell me - was it the Quantum Dots you were looking at? "Wish it came in Smooth"
I think it would be way cool if it came with smooth glass, and the water refraction, and have the table reflect that with the colors fading into one another in between the bottles. it just seems to unreal. very good effects, but it's like one of those things you're not suppose to tamper with. I joined just to get this picture I loved it so much. I too would love to see a clean version of this where the glass is a little more clearly defined without the water color look to it. Not sure if I'm describing it correctly but you know what I mean. Is that possible? "Also putting in a vote for Abstracts!" Have to agree with the other comments siding with the Abstracts.. While I often look at the scenery wallpapers and think they're really well, I always seem to end up choosing an other Abstract as my next wallpaper (or sometimes a planetscape). So here's a vote for more abstracts whenever you can, and bugger those ratings! Dispersion is stunning. So vibrant in colour and detail. "Would love to see a version with a smooth look." Love the image, love the colours. I would be really interested to see a simpler version with just plain glass. I think it would look amazing against with the reflective glow of the table. This is one of the most vibrantly beautiful images I've ever seen, and it shocks me not one bit that I found it on your site. Thanks for the great desktop! Is there any chance you could make the Dual Widescreen version of this look a little more like the single screen version? I really like the darker outside edges of the single screen version, the dual screen version feels a bit too tight, I need some room for icons and be able to see the jars. It just feels a bit too much in my face. Regardless, it is still gorgeous. I've got to cast my vote for the abstracts. Sorry, scenery lovers, I just find that sort of thing more appealing. This image is, pardon the pun, 10 shades of awesome. What a brilliant image. This is so well arranged - there is a real sense of light diffusing across jars. I'm a Libran - we love these multicoloured images. Please do some more - northern lights or fractured rainbows or the like. Please!!! You could make colorful images like this for the next year and completely satisfy me. Awesome. personally i think that this picture is the best yet. the use of all the colour is wonderful; especially the way that the reflections are played out and blended together. Not to burst your bubble, Frank, but every single entry in the Members Gallery starts with an iPhone size, then 1152 x 864, and the next at 1280 x 1024.
keep up the good work RB! As shocking as it may seem, not everyone's got monitors or TV displays that show those extreme resolutions. is there any way to get some of these back to the more default resolutions that used to be developed: 1024x768, 1440x900, 1280x1024, etc. ? I guess I'm weird. I only like the abstracts. I really love your stuff. My brother and I used to do this with Highlighters and bottles of water. Then you turn a black light on them and VIOLA! Absolutely beautiful render! I love all your stuff and this is stunning. I work at a very large research facility as a system administrator. Considering all the scientists and researchers around, this is VERY apropos for my tri-screen admin workcenter. Just wanted to drop you a line and say Happy Birthday. Hope you have a nice one. "Noo dont stop the abstracts"
Personally i like your abstracts espcially the dual and triple heads. I havent changed my wallpaper in about a year since I got a hold of Pathways. is anyone else bothered by the fact that some of these people are completely bashing the quality of the work on DB because they don't like a few of the images this year? i am. maybe if DB was run by some giant corporate machine with no soul charging on a per-download basis, there would be some justification for calling what has been produced this year a "waste of time" or "useless". however, last i checked, ryan is just a regular guy with a wonderful passion for artwork. he charges per membership, not per download. he renders dozens of versions of his work to make people happy. he responds to his fans. he posts pictures of his family. give the guy a break. most of us enjoy the variety of styles and support the fact that ryan is not afraid to step in new directions from time to time with works like "dispersion". its a good change of pace, and certainly brightens up my office. if you don't like his abstracts, don't download them. Not at all a lazy effort. Very nicely done. I especially like the reflection and the texture in the countertop. Ryan, I love your artwork, but this seems a little lazy. I could be wrong. This is the best one I have ever seen and, you really do amazing work! It reminds me of the movie Superman (the first ones with Chris Reeves) and the icicle home or whatever you want to call it. the place with all the crystals, etc. great job man! This is my current background. I don't always like the abstracts. They are often a little too monotonic for me. Come to think of it I don't always like the sunset pictures either, for the same reason (the arctic scenes are notable exceptions). But this is colorful and I really like it. Is this the sort of background that would lend itself to a bit of movement like fluorescence? Maybe some ripples in the water and slight changes of light? I don't know anything about what you do (other than that I like the results) so I don't know if that is a feasible sort of thing. But I think I could probably stare at subtle light movements through water for hours. I love Ryan's Abstracts like this, they are a great break out from the norm! Thanks and keep up the great work, You got another year renewal from me! I love this one it is my current desktop. Any chance you could do a version like this with vacuum tubes (Electronic valves) as they glow like this. It would make such a good retro desktop. "I think your abstracts are very nice." I think with the abstracts a balance of color and shade and simple shapes are often best. "Effective use of colour eh? ^_^"
Just the variety of colour makes it look appealing. I don't like the outline of the bottles though, the watered-down look just washes it away. So colorful, bright, sharp! I love it! First, I agree that the sceneries are good for escaping. I like them when I'm stuck in my cube, with no windows in sight, and I can get a little piece of nature on my desktop. 2nd, I do like many of the abstracts, as well, and tend to use them at home, where windows are plenty, and I can see the world outside. I wonder if the colors have any effect on the ratings, though, for many people. It seems that most of the abstracts, like "Dispersion", have bright, neon colors on a dark background. These tend to shock the senses more than the conservative colors of the scenery images. I am more selective with the abstracts, I think, because I have to be in a certain mood, and find just the right color combinations that match that mood, to really enjoy any given abstract. I definitely do like both, even if I do tend toward the sceneries more often - so keep bringing them on, Ryan! Your work is outstanding! I thought that was very rude. Ryan has been getting so brilliant, he hasn't done an abstract in ages, and his work has become so much better now. Not everyone hates abstracts, I really love this image, I thought that was not very constructive. Look forward to your next image Ryan! This is probably my favorite abstract on the site next to 'Sangre' (I'm partial to the color red). "Glad to see some variety"
I'm happy to see this new and different wallpaper, even though I don't particularly like it myself. I think experimentation and variety will be better for everyone in the long run. I wish I could change my vote to a 10 on this render. The more I have it on my desktop, the more I like it. This is easily one of the best pieces you have ever done. I have this as my background on my computer at my office in a design firm and I have had more comments from people wowed by this picture than by anything else I have ever had on my screen. You, sir, are definitely a genius. "On the other side of the coin..."
But seriously.. I like what was said about desktop images being a form of escapism, and that sceneries work much better for this than abstracts. I mean, the sceneries are amazingly well-detailed, after all, and just as god (if not better) than a picture. I have shown the landscapes to friends when trying to describe a fantasy location for a role-playing game and a picture really is worth a thousand words. The abstracts seem to lend themselves more to the imagination, though, being less realistic scenes. I have used some of those as inspiration for locales or just 'feels' before, especially when I need something that is definitely 'out of this world'. Personally, I prefer the abstracts, and I think it is mostly because they allow me to create my own story to go with them in my head. I don't have to look at it and go, "Okay, this is a beach.. or a mountain..." I can look at it and go, "This is a collection of viral specimens sitting on a scientist's lab table... or the enormous Towers of Light in the fabled land of Vental... or vials of distilled emotion sitting on some would-be deity's bookshelf..."
Of course, there is still the occasional abstract that I go, "wha..?" to, so I imagine that the initial assumption is correct: there is no "right" answer with abstracts, because there is nothing "right / real" to compare them to. Crazy I tell you! Abstracts are the BEST. The sceneries are great but the Abstracts are almost all FANTASTIC. I always read how so many people say that they like the sceneries better. I think they're crazy. Your abstracts OWN. I find usually they are more creative and more interesting. I mostly find the abstracts fun to look at and very cool. I almost always use them for my desktop and other devices. Don't listen to them, abstracts forever! I love colours. The more you have the more I'm attracted to the images. I was reading some of the comments and yeah, I'm a scenery fan too. But I must say, because of the colours here, I really like this image. I've seen some of the abstracts and they're not really my type of image. This I really wouldn't categorise as an abstract though. It's more glass bottles with glowing liquids which makes it really cool. Great job on blending the colours. It looks like something out of a mad scientist's laboratory. I'll admit I'm one of the people that don't often find abstracts that appealing so I'm a poor critic for abstracts. I am thrilled with scenery art and my rating there generally has to do with how realistic I think the image looks. Of which, I might add, your current programs do a superb job in finer details. I can still tell a difference when looking closely, but very very impressive either way. For personal use, I only ever use the scenery images for computer/TV backgrounds. However, for personal printed CD backgrounds and such I mainly use the abstracts. So while I most use sceneries, I do use abstracts here and there. Anyway, that's my two cents. Your work is great and I always enjoy it. Thanks. I am a landscape lover ..I never ever have used any of the abstracts on my desktop even though I think some of them are pretty cool....I guess I can completely relate to what "twitch" is saying on that...but this one is unbelievably good...this is going to be my desktop favorite...loved the different colors and the contrast on the black background..its perfect thanks :)...great work Ryan. Disperion is generating rave reviews from everyone who sees it on my monitors and my im display! Wonderful Wonderful Pic! thanks Ryan!!!!!!!! Absolutely love your work, simply magical - dispersion no exception. Colours are wonderful, the only observation that nags at me just a little bit is the top lip of the bottles, they just feel too artificial - I like the hexagonal bottles themselves, but for me, I would like to see a more circular lip to the bottle top. I think one other reason why your abstracts may be rated lower than your scenics is that many people, myself included, use their monitor background as a form of escapism. This is a place I can imagine myself (Tropic of Capricorn). This is a place I wish I was (Shambhala). This is where I find myself now (Amazed). It sets a mood. It sets a tone. It can motivate you to get through the day. Don't get me wrong. I like Dispersion. I like it a lot, actually. But I'm more likely to get it as a poster print than I am to use it as a background. This photo is on my duel monitors at wrok, and looks awesome! Also got iton my single monitor, and PDA! fantastic colors..
Hey Ryan, nice blue light special you have here; I'm making reference to the blue lighting in the foreground that is illuminating the jars. This is a good example of what makes abstract art so attractive. Whether you like it, or you don't like it, it grabs your attention. Nice job, I hope you do more abstracs like this, it's refreshing. You're right, Ryan. Scenery is easier to judge because people have a point of reference - the real world. Usually, the criteria used is different for scenery, as we ask questions like "Does this look realistic?" or "Is the color right?" when viewing scenery. With abstracts, those points of comparison aren't there, so the images tend to invoke more of an emotional (or subjective, as Ryan puts it) response. I like both typs of art, but have found that the images that stay on my monitors the longest are the scenery images. I like the idea of tracking the standard deviation of the ratings for each image. My guess is that the SD for the abstracts is greater than that of the scenery. I have always only used the abstracts from your site. The landscapes are well done and all, but they just aren't as entrancing as the abstracts are to me. 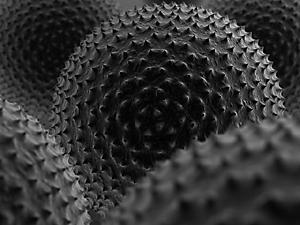 I like that many of abstracts have both a biologic/organic aspect and a surreal aspect. Though the landscapes are very beautiful, they still refer to ideas from the "real" world, whereas the abstracts delve into an imaginary level. simple, but so stunningly effective! i absolutely love this abstract and the range of colors it offers. i personally enjoy your abstracts more than sceneries simply because they are a form of escapism for me (although plenty of your sceneries rank among my favorites as well). I was delighted to see this new image - keep up the excellent work! ""Another World" aka "Out of This World""
I think I never posted a comment here before, but this one made me "delurk". Strange how memory works... this image gave me a "Proust's madalaine moment". Thanks for that. You made my day. I agree with Terry about the "abstract scenery" concept. Like others, I use your creations as wallpaper and screensaver, and their value to me is in the escapism they provide from not just the negative in the world but also the mundane. And the escape is in the surrealism of the sceneries that hold that little bit of magic, that little interjection of abstract, that little bit of 'whatever' that requires a small, brief suspension of reality. I like to pretend these places exist, perhaps in Shambala. love the concept and the colors. the bottles still seem like they could be less blocky, but overall good job. Im still seeing a bottle cut down the middle with the apparnt new render. Like others I echo the preference for landscapes and scenery but I do like this for some reason. At first glance it struck me as visual music. My only disappointment is that you've done away with smaller sizes. Some of us are still running at 1024. I too seem to prefer the scenery images, but I have to say your abstracts are stunning. I would like to echo a comment I read on another image and say that I would like to see an egyptian themed image. Looks great i have it on my computer at work and at home!! I'm attracted to the landscapes because they have a soothing, calming effect which is especially nice on my work stations. I enjoy the abstracts, as well, and appreciate the art...just prefer gazing at a refreshing fantasy scene especially in an environment working with the public. The glass structures are lovely. I think this is wonderful. I love science, and while I think your landscapes are amazing, I think no less of your abstracts. Like any artist, you create, and in my book, creation, and the beauty of it, is in the eye of the beholder, as well as the artist. All I have to say to you is this: Keep doing what you are doing. I check you site often, waiting (impatiently: it's one of my flaws) to see what you've created next. Every time you've posted something new, I get excited, typing my login name so fast I miss keys. Have no worries about your abstracts; there are many of us who love them. So far, this one is my favorite (but, hey, I was a science nerd in school). Thanks so much for sharing your wonderful work. I personally like all your abstracts. Even though the image itself may not appeal to me in a particular way, you choice of color and theme are always wonderful to behold. Just wanted to add another comment saying thanks for fixing the dual screen version, it looks MUCH better not having that bottle split down the middle. Your abstracts have always been my favorites of your work. This one doesn't do it as much, but overall, I prefer the abstracts more than the landscapes. I love this!! I know a lot of people say they like scenery, but I tend to tune those out more (not because of the quality of your work, which is OUTSTANDING), but because often times nature has more muted colors and because I can get pictures of scenery anywhere. The composition of the jars, as well as the awesome colors and the amazing reflection on the surface just wowed me. I love colors and when you use them like this, these renderings are usually my favorites. I will keep this one on my desktop for a long time! Great work! This looks great, the colors, the subsurface scattering (yup, you got the hang of that quick!). I really like this, a rainbow of color embedded in a black background. How can you go wrong? Love this one--the full range of color is striking against the dark background. One of my favorites of all time... I'm currently using this on all three of my computers. Love this one. The scenery is great, especially the ones from other planets, but I abstract are the best. Have this on my computer at work and had a co-worker tell me this is the best one yet. I cannot wait until the next abstract. I'm glad you did not change the bottles. The Link for the dual widescreen is broken. I agree with your assessment of the differences between the two art types. I know from my own experience playing with Apophysis that what I see in an image someone else might not see at all, or as something totally different than my own interpretation. More than once I have had someone ask "What is it supposed to be?" With a scene, you don't really have that. A mountain with forest and water is recognized by everyone for what it is - a mountain with forest and water. The composition is still important, but it is recognized as what it is... Still, with that being said, I like both types of backgrounds. (I usually alternate between your scenes and my abstracts :-) Now that I have switched to running dual displays at work and at home, I also find that the break between the two monitors helps me decide if I use an image or not... I prefer that the break be as unobtrusive as possible... You do a good job doing that, whether by accident or intentional - THANKS !!! While I'm not one to usually have your abstracts as my desktops often (I'm more of a scenery and planetscapes type person), I do change my desktop enough that a couple abstracts make it into the 'cycle'. I do really enjoy them and I definately like this one. It's very pleasing to the eye. I do have to agree with ppisarek's comment though, I put the dual screen (2560x1024) on my desktop at work this morning, and the bottle stuck in the 'gutter' between the two screens (the green, 6th bottle from the left) is a bit distracting. As there are 10 bottles, would it be possible to shift that bottle an inch or so to the right. If you did that, then there would be 5 bottles on each screen. It works well as a dual screen with one exception. In the "scenery" images I have downloaded to dual with a 2500X1024 image the picture splits where it does and there aren't any glaring issues. In this one the green bottle (6th from the left) gets split right down the middle. Not that I have let that deter me from making it my new background but in an image version designed for dual screen, could the bottles be shifted to one screen or the other? PS How do you manage to keep up with all of your designing, rendering, versions and revisions with not one but two gremlins in the house now? ...gotta hand it to you. Personally I like to have the scenery on my desktop. I'm stuck in an office in the middle of a building,, working long hours, with no chance of seeing any natural daylight, and I like to have the scenery to remind me whats outside here. For me, my all time favorite image is still Flurorescence (sp?) and it will always be my fave. It just looks awesome. This one is not my favorite. To me it's some glowing jars but hey, it still looks kind of funky and it does have some cool colors in it so I'm down with it as my desktop for a few weeks. I think for me, whether it's a real scene or something from your imagination, it doesn't matter. As long as it looks cool and is interesting. Looks like someone took really old glass containers and poured some kind of UV-reactive liquid in them. I'm not a big fan of the abstracts. However I don't think you should stop making them. Abstracts have always been and will always be my favourites. Theyre why I joined! I agree with what your saying. I have always preferred your scenery pieces as its a personal thing that I like to imagine being somewhere different when at work etc. I don't tend to judge your work on how well its done as I dont believe there is a right or wrong way, art is what you make it and obviously people can say what they think but it doesnt mean your wrong. Maybe you could try mixing scenery and abstraction? Saw Open Season the other day, has beatiful visuals but it has a unique abstract style to it, the tress dont look particularly real, almost cartoony but it combines realistic features such as water and weather effects etc but it still looks awesome. Maybe this oculd be naother direction perhaps? I've been messing baout with Vue a little of late and I've not seen anyone try this as its going photoreal these days. The thumbnail doesn't do it justice. When viewed at a nice resolution, the details in the glass are revealed. I particularly enjoy the transparency of the glass as well as the way some light from the other vials is reflected on one another. I believe most people would rate something higher if it is something they could relate to, or something they could grasp physicalily or mentally. I honestly have not looking at the ratings and based on previous abstracts, I would think this one may have a higher rating within abstracts. It is something the mind can phisically grasp rather than swirls of colors. Even planetscapes would gain higher in the mind because it is also something possible to grasp. As for my personal opinion on this great work, I have yet to see one come out I did not like. I have been a full member for almost 10 years and I have maintained DB as my home page since 1996 so I can always know when something new comes out. Keep up the great work Ryan and I constantly tell people to see the best artwork on the web. pretty but kind of boring. That's my opinion of the overall art. The technique is amazing. Looks like a photo. Actually, abstracts and planetscapes are the ones who made me loved your work. I thought abstracts where gone, too bad, and finally I'm happy to see they're back. Great colors and the blur-glass effect is good too. I think its ok but it does'nt wow me. When I set a background I want to see alot of detail and something that fills the whole screen. I respect the fact that you wanted to do something different for a change of pace but this is just too bland, sorry ryan. I still think you should do more posers. Frio was your best, still waiting for a sandman version if you ever want to endulge me. Love it. Relaxing with good use of contrast and color. Perhaps you can have a standard deviation calculation added in with the ratings on images? By doing so, and having an ability to sort images as such, users can flip through images that have a poor average, but extreme viewpoints in terms of votes. In other words, if 1,000 people love it, and 1,000 people hate it, the average would be 50%, but the standard deviation would be a high number, indicating that it really depends on your opinion. Then you can look through "crappy average" images that have a polarized love/hate relationship, and see what side you fall upon. Rather than ignoring them, thinking they're crappy due to poor votes. I wouldn't say that I have a preference in terms of abstract images or scenery images, but it seems to me that the abstracts are more often the ones that impress me the most. With an abstract image, you are free to create just about anything you can think of - there are no boundaries, and as fascinating and intriguing as nature can be, your imagination can dream up things that would never exist in nature. That, to me, is what makes the abstracts so cool. Often times I find myself wondering how you manage to think of these images, but that just speaks to the talent you possess. Keep it up, and keep giving us the abstracts. I absolutely love the single-monitor version of this. However, my monitors have fairly wide frames (2.5cm on each side), so there is a good 5cm margin down the center. For most of the wallpapers, the shot is set up so the margin doesn't detract from the image, but for this one, it cuts right down a bottle. Ryan, I'm not a huge fan of the single screen image. Than being said, the multimonitor renders look amazing! Way to step it up! I love the slight changes of perspective to capture the wider images! I think the abstract is cool looking. It has great use of color and the detail to the glass is awsome. However for some reason it did not look that good on my desktop. I am sure that it has something to do with my monitor and not the wallpaper itself. All in all a great abstract. Thanks for the rainbow colours. It seems serendipitous that I would find this today as today is Ottawa's Pride Parade! Keep up the great work! Wow this is pretty cool!! What incredible color!! And the light is perfection!! This is one of the few 10s I have ever given. This is definitely going to stay as a wallpaper on my computer for a long time! I really like this one, and sets apart from the traditional scenery pictures, and stands out with its vibrant colors. Excellent work, and flawless as usual. Keep it up Ryan! In regards to your concern about abstracts vs. sceneries... I think abstracts are great, if done well. And being honest, you do some really great abstracts and then some mediocre ones too. Actually, let me clarify, I think your older abstracts from before 2000 were okay. That's probably only because of the software and technology back then, I don't know. Either way, this image is one your best Abstracts! The detail to the glass is just phenomenal and the clarity is of utmost excellence! Whatever it is that made this one this great, keep it up! I encourage you to do more great Abstracts and I know your skill for them can be just as good as your best sceneries. This one CERTAINLY is right up there with the great scenery ones, without a doubt! So don't be discouraged about the abstracts not rating so well. The realism on the refraction of light from the glass is amazing, and the colors are beautiful. I've been a member for years and never thought any image you posted needed to be tweaked or tuned - after all you're the artist! No need for backseat directions. Well, I personally would call this more "Still Life" rather than abstract. However, since there's no catagory already set up for still lifes, I can live with "Abstract". In either case, the works are wonderful, including this one. There are several abstracts that I end up putting up on my monitor from time to time, that I consider to be some of your best work; "Fluorescence", "Containment", "Orthohedron" and "Neuronet" to mention a few. There are others, especially from your earlier work which I like, but are too bright and/or distracting to the eye for use as a computer wallpaper. "Cerulean Blue" and "Iterator" both leap to mind, the bright colors and the patterns on these tend to make it more difficult to find one's icons on one's desktop. Perhaps that is why some of your abstracts get lower rating? They're beautiful as stand-alone pieces ... but don't work quite as well as a computer wallpaper. Though I don't like it as much as some of your recent stuff (I like the landscape stuff the best), I do see a definite place for these abstracts. I agree with Ryan that these images are subjective but I still look at all of these images as works of art that deserve appreciation because it is something that most of us could never accomplish ourselves without the kind of vision that Ryan obviously has. "I really really love this one!" I have to say that most of the abstracts you do are amazing. Scenery ones are great but my favourite wallpapers are always the abstract ones! Keep doing these, it'd be a real shame to limit yourself! don't stop doing abstracts, they are great too. Can I ask that you update your themes for PDAs with some of the newer images (if it is not too much work). Thats one reason I like DB: sometimes there come totally unexpected pictures. I like the way the refraction of the light in the glasses make the glasses look not smooth. This is definitely a pretty cool looking image, but I have a big problem with it. As a recent chemistry graduate, seeing these bottles sitting out open really bugs me! You've gotta put caps on them! Quickly! Very cool looking though. This one is awesome! A nice break from the nature/planet scenes. Simple, subtle and colorful. Would really love a dual monitor version btw. This just screams "new iPhone wallpaper". The bottles could be a little sharper though. your abstracts are the best of them all! don't let them tell you otherwise!!! I will have to agree with some of the other comments. I think the glass could use some touching up. However, I have never used an abstract as a wallpaper, until now. I rate this an 8, and really look forward to viewing the update. Keep up the outstanding work, Ryan. I read a lot of people saying to change the glass, but I love it, the way the glow from the bottle next to it changes the colour on the glass looks great, much better then if the glass was smooth with no texture. One thing thought, this render gives me ideas for another one, change is the containers, put them all in test tubes on a rack, with lab monitors flickering in the background, but thats for another render I guess. Ryan, I hope you will indeed continue to make abstracts, they're not only a nice change of pace from landscapes, I'm sure they offer good opportunity for you to explore new effects, materials and textures that you might want to use in other images. Dispersion is particularly well done, and I'll bet it will appeal to many younger people: I distinctly remember a "rainbow phase" in my teens when I loved making and acquiring images that showed off the entire color spectrum. I never found as luminous and rich an image as this one, until now. Not my favorite.. the liquid appears overly distorted through the glass. Nice colors though.. and the reflection on the surface looks alright. I'd work on clearing up or modifying the distortion.. I love the tranquility of the many colors. The bottles look a little rough. I think that was the point, but I would prefer the view through the glass to be a little smoother - ripply, but smoother. Please stick with the image if you feel you can improve it. I like it. My favorites are your abstracts or pictures of this kind, and I would love to see more of them. I bet you'll have the colors clearer in time. The colors are fantastic. So my opinion is keep up with this change of pace! It has a peaceful and beautiful feel. I've been a subscriber since 2000. I just wanted to say that your abstracts and planetscapes are the main reason I keep coming back. Fluorescence, Cosmogony, Tropical Moon, and Tendrils are just a few of my favorites. I even have a huge prints, in expensive frames, of Neuron and Something Blue in my living room and computer room. Dispersion isn't one of my favorites. I like the different colors, the glow. I can't really put my finger on what I dislike. If I had to pick something, I would say it's the bottles. Well, you can't make everyone happy 100% of the time. Keep up the great work! I have to agree with overdrive here that the glints in the glass look very artificial. I had to check my display settings and make sure I was using 32-bit color. Also, for this image to look more natural, I believe that the luminosity of the colors should be toned down a little... they all look extremely radioactive. However, this should be a candidate for a facelift, as if the unnatural glints and color dispersion in the glass were touched up, it would instantly be one of my favorites. The neoncolors on a black background are absolutely beautiful. However, the reflections in the glass sometimes look odd and artificial. Like there's paint on the glass, not a reflection of light. I wonder why these reflections can't be as convincing as the ones on the surface beneath the glass. I absolutely love Dispersion! WOW! I really like this! i think it would be neat if hte bottles were round though, and different sizes and heights. overall i think its beautiful! I'm blown away by it. At first from a distance they looked like glowing crystals...when I saw the image larger I loved it - I love glass, colored glass, and what you have achieved here is inspired. I must add the reflection on the surface is superb! I generally like scenery better, but this is just good! It grows on you. I like the fact that it is arranged in the color order of the rainbow. I really like the way you have each bottle glowing with it's own color. It looks a lot like what I do at work (I'm a chemist in a laboratory). I really like it and will use it as my background on the lab computer. I love neon color images-neat job here. Quite lovely. I like the pure vibrancy of the colors. Although the abstract pieces don't seem to be as popular as landscapes, I for one really like them. Please continue throwing them in the mix from time to time. I'd definitely agree that it's the variety in your subject matter that keeps your site so fresh. I'm always looking forward to the next image, and that's been the case for YEARS. If you just stuck to the most popular type all the time it would inevitably get stale (and you'd probably burn out as well). So indulge your imagination. What keeps you happy creating is what keeps us happy viewing. I just graduated with a chem degree and this reminds me of some sweet stuff right out of instrumental lab. Although the glasses aren't smooth, I don't think they need to be. A lot of the scientific storage equipment is not smooth for the very reason that it changes the dispersion of light in the canister, which is helpful for some compounds. Love your abstracts a lot, especially ones that have a "chemistry" theme to them!! Keep up the good work! maybe try smooth bottles but instead maybe try bodd shaped glass blocks? iono mate they look like baby bottles. I've been thinking... what would it look like with a few different bottle sizes? It looks great as it is, just thinking what it would look like with some different bottle styles? Great change in scenery ;) - Keep up the good job trying abstract stuff. You're doing great. I gave it a 9, as I'm careful where I use 10. It's not far from a 10, however. Absolutely terrific. I think it's great to have a variety as well. I like scenery because I like the depth, but one has to appreciate such delicate work here. BTW I think the edges look good. Why should they be round? Props. Keep it up! This picture is great. I read in some of the other comments about giving the bottles more rounded and smooth edges, I think that is a great idea. Look forward to the update. Keep up the good work. Ryan, I swear, I'm going to need more moniters, just so I can have all of you're stuff up at once. I really love this image. I normally like the night scenery better, but this almost looks like phosphorescent crystals in a dark cave. I think its the shape, maybe? I looked at the image you took for inspiration. I have to say, I like your's much better. Eventhough though I have noticed that even I am rating abstracts lower than everything else, PLEASE don't stop making them because they are still the best out there and do provide a nice change of pace. I'm such a sucker for non-cutesy rainbow stuff, and this is absolutely perfect. Reminds me a bit of alchemy, really. I love it! the colors are just beautiful. I happen to like a change with the abstracts once in while myself. Thank you Ryan. Only thing that I'm not a fan of is the unsmooth glass in the bottles, it's not perfectly clear...just doesn't look as good to me..almost like it's low-res, until you look at the glow below the bottle. At first glance - and with great anticipation after your last few pieces - I was not excited. After a second look and actually using it, I like it. I'm looking forward to putting it on my iPhone, should be perfect for it. "I joined for abstracts and this is why!" I love this one a lot Ryan. the colours are amazing. and its almost passible and a photo. but as others have mentioned it'd be nice to see it with a smooth/reflective glass look. That's one of the best so far, you could pass that off as a photo!!! I like this one mainly because it is simpler that most of the backgrounds here. Fewer elements means I can use this with my transparent terminal windows to good effect. Ryan, I just wanted to let you know that your abstracts were the reason I joined the site in the first place. I like them the most, and I'm sure many others do as well. this one is easily one of your best abstracts. this one is definitely reminiscent of the plasma design wallpapers. even the rendering style is more abstract than photorealistic, as the glass kinda has a painted look. i agree that a new version should be done with more clear, smooth glass, to see how that looks. good wallpaper though. Like you said, people seem to not enjoy abstracts as much as your other renders and while I normally have to agree, this is a most excellent render. And thanks for the separate iPhone version...this will look GREAT as my background! I really like this one! I would like to see it with some round bottles though & have the glass less rough and more like the clean "mac" glossy look. That would look hot I think! I really like this, more than I usually like your abstracts. It reminds me of some of the PlasmaDesign wallpapers. But I'd like it more still without the "artsy" look to the bottles. How about a straight version with smooth, reflective glass? The surface that the bottles are sitting on is very well done. Love the light effects. I like it! Would it be possible to do a variation with all one color liquid? Say, all blue or all green? That would be quite lovely..
IMO your abstracts make up some of your very best work ! This one is no exception. Also, one of the things that makes me renew my subscription every year is the diversity of your art, and the abstracts are an important part of that. Your site never gets boring, because I can never guess what you'll come up with next. Great and fascinating work! I think this may be my favorite desktop thus far. I love the scenery desktops, and the abstracts, but this just ... well, gets everything right! If this is a new direction for you - please, take it!! I'll be the first to say I'm usually one of the people to not like abstracts but this is the first I've actually really liked. I like how vibrant it is, not sure what the weather has been treating you guys in America like but over here in Blighty its been grey for as long as I can remember. This will brighten up the coocmputer at work nicely. Dual & triple of this should be interesting! I just wanted to let you know that your abstracts are some of the best around I have seen. I too do a lot of abstract artwork and seeing your abstracts on the web is what prompted me to become a member. I hope you will continue to do your abstracts regardless of what your ratings are at. Your site just wouldn't be the same without them. Also I love the colors in the image absolutely brilliant. Thanks for your awesome artwork and keep up the good work. I really love the idea behind this, and for the most part, i really love the wallpaper too. But the glass does look odd. I'm trying to remind myself that it's an abstract so maybe its ok to look odd, but its a very distracting kind of odd. I'm not sure what is wrong with the glass, but it looks kinda like its been rendered in only 256 colours or something. It looks great on my laptop--lots of response to those who saw it around my office. PLEASE do a dual screen version for it! I want it! Sorry to say, this is the rare case of one of your works that looks significantly better as a thumbnail than at full resolution. When I can see all the detail, the perfect plainness of the interior of some of the bottles really jumps out -- especially the green one in the middle and the yellow one just to the left. Basically, there are too many areas of solid/flat color, and the surface lines of the liquid within the bottles is too much a perfectly straight line. It looks "computery" in those areas. Perhaps adding some kind of unevenness on the water surface within the bottles -- like a meniscus, where the edges are kind of higher and lower slightly, varying with the imperfections in the glass? And/or perhaps putting a few more bottles behind the plainest-looking ones here, to get something refracted through them? Really like this one - deffently a hit for all that love rainbows! Deffently do more like these. It looks like a bunch of baby bottles, with one of them apparently containing Mountain Dew. "Nice but needs a few changes"
However, I think it needs a slight change. The glasses need to be rounded off better as it's causing alot of disturbance between them. I'm a chemist, so it's absolutely great to see a wallpaper like this. Reminds me of doing phosphorescence experiments in college. And I especially like the fact that the jars aren't all clear. The fuzziness/waxiness just adds to the greatness of this picture. Excellent! Topher suggests: "Maybe you could make a poll of which categories people like best?" Awesome wallpaper, Ryan. I love seeing the abstracts, personally. And there are times when I'll just throw an abstract up on my wallpaper because it's been a while since you last did one. All of your wallpapers are excellent! I like the abstracts best of all, and actually joined up because of the abstracts and how they look with Vista's Aero interface. "Amazing Colors! Just One Suggestion...."
I really like the way this render... turned out to be simple but expansive cause of all the color! My one suggestion would be to go with a different type of glass as the one used has a very strange look to it. I can't quite put my finger on it but something about the glass just looks off. It's an abstract though and this is your imagination so by all means keep it the way it is! I think my favourite *wallpaper* so far is Crucible Planet, with Smidgeons a close second. I think Dispersion may give them both a run for their money. Thanks for all the lovely pics. Beautiful! This makes an awesome wallpaper! About the abstracts vs. landscapes I certainly enjoy both types of wallpapers. I find the variety in your wallpapers to be a big plus. I like the abstrats but don't like this one. "Dude, I LOVE the abstracts!" In fact, I think it is the abstracts that really keep me coming back for more. Don't get me wrong, I love the scenery stuff, but the abstracts are fascinating. GREAT work Ryan, and keep 'em comin! your abstracts are my favourites by far. the sceneries look great but in my opinion an abstract makes a better desktop background. with a scenery on my tri-screen rig i'm often covering the main focus of the scene with windows on my middle screen. but with an abstract the art is often much more distributed over the three screens. here's my usual request (plea) for tendrils*3. Like the others, I often prefer your abstracts, much as I love the landscapes. Love the abstracts indeed. Colors, placement and realism all in the right tone here, imho. While I do tend to enjoy your secenary images the best, it's nice to see an abstract every so often to change things up as you said. This one is appealing because of the pretty colors against the darker background. Renders like this keep me coming back. Very cool idea! It definetly changes up what you have been working on lately. I enjoy everything you create. I am partial to images that are dark in color as they are a good contrast to have as the background to my PC. I am looking forward to seeing Dispersion as a duel screen version. As I look at this image I can imagine that it sure would be a shame if one (or more) of those bottles were to tip over and spill because the colors would get all mixed up in the spill! nudge nudge... if you get my point! whether it is an abstract or a scenic render, they each go on my desktop as they release. i constantly have co-workers staring in amazement at your work. please continue doing abstracts. even though it might just be a "change of pace" for you, there are many fans (including myself) of said work. On a different note: When I saw this pic as a thumbnail in my rss-reader, I thought the glowing objects were houses, like a very weird skyline, would also have been a cool motive. "And now for my 2nd year." Well Ryan, it looks like you've done it again. This is really good, and being a Chemical Engineer, makes a good wallpaper! *This is sarcasm, I am British. Wow! That is one very cool render! Excellent work! I am quite taken with this image. I especially like the vivid colors against a very dark background. I agree that it really doesn't fit into any of the exisiting categories so I don't really have a problem with "Abstract". I think "Still Life" might be a good choice for a new Category though. I LOVE this. 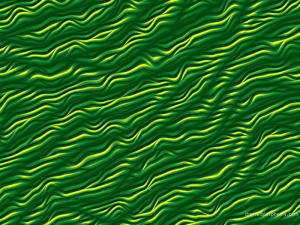 Your usual "digital" abstracts, while intriguing, are typically too "busy" to make a good wallpaper. Something like this, with nice pure colors and a lot of "blank" space on the image, makes for an interesting background to my everyday computing. I'd love to see more abstracts like this, playing with color and light and everyday objects, perhaps juxtaposing them with things that defy the laws of science & physics? I think that's some of what was cool about Fluorescence - everyone knows that no mushroom is going to glow THAT kind of blue... but it looks cool. Maybe you could make a poll of which categories people like best? Mine are scenery and space. I actually did a separate render for the iPhone version (and another one for the 1280 x 1024 version for that matter). I didn't want to crop out any of the colors. My favorites of your work are your abstracts! I'm an engineer, the abstract stuff is just SO much more interesting to me. Your landscapes are beautiful, but your abstracts are the ones that wind up on my desktops. PLEASE don't let the opinions of the "others" get you down, a lot of us LOVE your abstracts and would be disappointed if you stopped! A welcome change from your landscapes and abstracts; you could just as well have called it "Diversion." I'm sure I'll keep it on my desktop for a while. I have always preferred your abstracts to the scenery. Mostly because I use Linux with a lot of transparency, especially transparent terminals. The scenery is often too busy and distracting for the text of the terminals, unless I turn the brightness way down, which just makes the image too dull. Anyway, I like how clean and colorful this image is. Please keep the abstracts coming, I love them! This one included. "Not one of my favorites"
This one doesn't really do anything for me. It's well-made, but I think it's kind of boring. Just these bottles that go through the color spectrum sitting on a black surface. The bottles look very realistic, but I don't think it's the best thing to have as the focus of a wallpaper.